The United Nations has asked its member states to observe an Olympic truce from one week before the upcoming February 9-25 Winter Olympics until one week after the March 9-18 Paralympics in Seoul, South Korea. South Korea has asked the United States to delay its war rehearsal flights over South Korea until after the truce. Please click below to sign a petition that can be printed out and delivered to the government of every nation on earth. Please add your own comments. 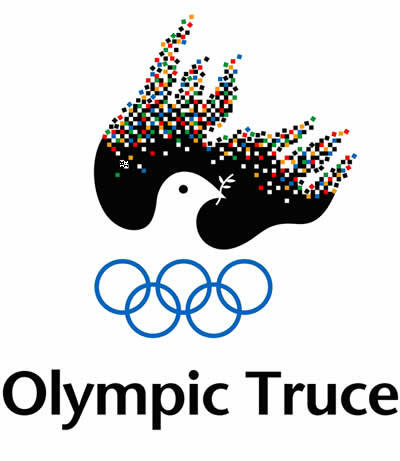 24577 10 months ago William G Gonzalez Suffern, NY , US TO: UNITED NATIONS: AS A PUBLIC COMMUNITY REPRESENTATIVE, I ASK YOU, AS A WORLD ORGANIZATION TO PROMOTE THE OLYMPIC TRUCE, DURING THE OLYMPIC CELEBRATIONS! 24575 10 months ago Traian Cainaru Buffalo, NY , US USA mass media has been pushing for war with North Korea. Stop this brainwashing war hysteria by the Mass Media! 24572 11 months ago Jamie Hines Tampa, FL , US ALL the world knows chumptrump is a moron. Please don't hold that against U.S., we're trying to get that megalomaniac Out of office & ALL his lackeys also!! !